I might not be the best person to review Interstellar. I'm fascinated by our universe and deeply moved by its scope and mystery. I think most people, if they take the time to look up from their smartphones into the sky, also know this special feeling of humility and wonder – I simply tend to indulge in it more often. So I am sorely tempted to heap platitudes and justification upon Chris Nolan’s latest (and arguably greatest) effort, because – while hardly a perfect movie – I think its power to remind us of these feelings can be understood by anyone. So meet me halfway: check your cynicism at the door, and I'll do my best to abandon purple prose for sober consideration. I hardly felt sober, though, walking out of the cinema. Even when it descended into cheesy, pandering dialogue and hippy-dippy metaphysics, I was drunk on Interstellar's sentiment. At nearly three hours, there’s a lot to unpack, nearly all of it carrying a significant emotional payload. I was mentally and physically exhausted by the time it was finished. Interstellar is a cinematic experience I won’t soon forget, and for its broad appeal and powerful storytelling it should be counted among Nolan’s best work. Matthew McConaughey plays Cooper, who lives in the dust bowl that was once the United States with his children, Murph (Mackenzie Foy) and Tom (Timothée Chalamet), and his father-in-law Donald (John Lithgow). They eke out a living farming corn, which is the only sustainable crop not yet laid low by “blight”, the unspecified plague which has brought human civilization to its knees. Cooper encourages Tom’s readiness to take up farming, but knows the exceptionally bright Murph is meant for more than what her teacher calls her generation’s “caretaker” work. He ignores his own training (engineering and astronautics) to prioritize single parenthood, but it all feels futile; what’s the point, when even the corn will eventually stop growing? His restlessness comes in handy when he’s picked up by an old mentor, the aging physicist Brand (Michael Caine) and commissioned for a desperate Hail Mary plan to save the human race: a space mission that will take him through a wormhole near Saturn to another galaxy, which contains worlds that might be suitable to sustain human life. To explain more is to dull the impact of the film (not to mention violate my practice of spoiling nothing except what’s in the trailer), so I’ll leave it there. McConaughey is proving to be a storehouse of effective and subtle performances – his turn in True Detective being one of the finer television performances I’ve ever seen – and he’s put to great use here. His measured baritone sounds perfect relaying commands, information, and folksy charm over a spacesuit mic, and his relationship with Murph forms the emotional core of the film. Much like Shia LaBoeuf, he’s undergone a transition from “hey, it’s that guy” into “serious artist” and is backing it up with engrossing, distinctive performances. The rest of the cast executes their roles well, but none are as outstanding as McConaughey’s, who draws you in with his intense, watery eyes and soulful voice. 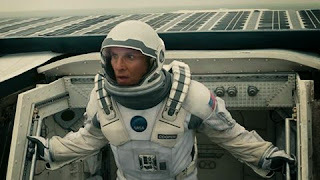 I’m of the opinion that a role takes on a different aspect when the character is wearing a spacesuit – there’s a lot of subtle work that can be done when the audience is trapped with you, breathing your shallow air – and McConaughey works with this to make Cooper one of the finest spacemen on film. Comparisons to other films with spacemen – notably 2001: A Space Odyssey – are unavoidable. Hans Zimmer leans heavily on the pipe organ for the Interstellar's primary musical motifs; the astronauts live on a rotating station that floats through the cosmos; the robots TARS and CASE combine HAL-9000 and the iconic black monolith into one design. I honestly don't think Nolan can compare to Kubrick, who belongs in the company of history's greatest creators and whose work will be studied for as long as we preserve film. But Nolan's aim is to create a work of equal significance, and I'm utterly amazed at how close he comes. In this case, I think "falling short" of Kubrick simply means that there's less of a surrealistic auteur-aroma clinging to the film, and that means that more people will see and enjoy it, and that's hardly a point against it. 2001 was many things, but personable and relatable it was distinctly not. Interstellar is as safe and comforting as 2001 was cold and clinical. That said, I don't think Nolan was necessarily the right person to direct (and co-write) this film. You ignore the illogicalities and inconsistencies of his films while you’re watching them, because you’re swept along by his relentless pacing and striking visuals, but once the lights come on, the glossy sheen tends to disappear. For the life of me, though, I can't think of who I'd replace him with. The mere fact that he stepped up to the plate to deliver Interstellar is reason enough for me to praise his effort, even if it is muffled by his tin ear for natural human dialogue and his oddly sparse cinematography, in what should be a visually luxuriant film. 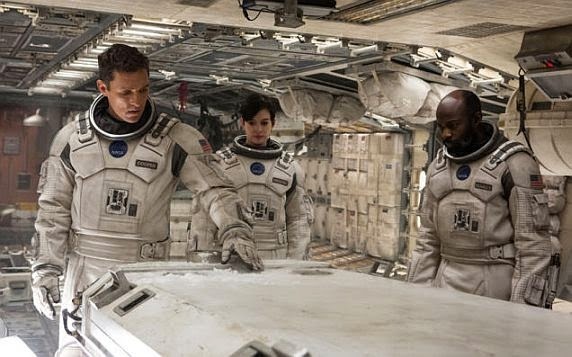 That's not to say the visuals don't impress – there isn't a single image that isn't convincing – but Nolan's spatial awareness seems limited to lots of tight shots and static placement, and a more assured hand on the camera (and in the editing booth) might have imbued Interstellar with the visual power and pacing to match its message. The film’s more outlandish material – traveling through a spherical wormhole, rocketing across the event horizon of a supermassive singularity – is actually the most scientifically accurate stuff in the film, not to mention that simulations of zero-G and the devastating silence of space are paid due service. The technical errors crop up in the more workaday aspects of space travel (apparently, light atmospheric crafts must be carried away from Earth with Saturn V rocket boosters, but can achieve escape velocity on other planets without additional fuel or thrust? The Endurance space station can travel within shouting distance of Jupiter without fatally irradiating the crew inside?). Not everything makes sense, and much is over-explained, which leaves little for the audience to contemplate on the drive home from the theatre – except, of course, the importance of space exploration. Again: no matter how much I’d like to, I’m not going to fault the film for that. The draw for me was the promise of an adventure in space. Not a schlock sci-fi adventure, but the very human adventure – the soaring joy and primal terror – of exploring the universe as pioneers. This is where Interstellar truly excels. Sure, there are the Gravity-esque thrills that come with the perils of space travel, but the juiciest cut of excitement is the pure thrill of exploring the unknown. Remember when people went to the movies to see something they’d never seen before, something they could hardly imagine? That’s Interstellar’s bread and butter. Cinema can indulge our basest desires, but it’s so genuinely pleasant to be reminded that it can uplift, and inspire, and excite, without resorting to empty profanity or needless violence. Interstellar is destined for popular classicdom, providing all the excitement of a blockbuster with the weighty significance of topical urgency, hung on the framework of a simple, homegrown father-daughter relationship. Films of this much pure value for your box office dollar are few and far between, and it’s wonderfully accessible, despite its lofty content. This is a film the entire family should see together – its themes of familial love, inexhaustible yearning for knowledge, and the bravery to boldly go where no one has gone before will resonate with anyone old enough to identify them. Besides, if you know Mom won’t go unless it’s a tear-jerker, tell her she’ll be pleased to see Dad sniffling right along with her. Anybody not swayed by the power of this film must be utterly choked by cynicism, desperately in need of what Nolan delivers in generous helpings: hope. Interstellar spouts platitudes and promises, but it hits all the notes it’s aiming for, and they all ring true. – Justin Cummings is a writer, blogger, playwright, and graduate of Queen's University's English Language & Literature program. He has been an avid gamer and industry commentator since he first fed a coin into a Donkey Kong machine. 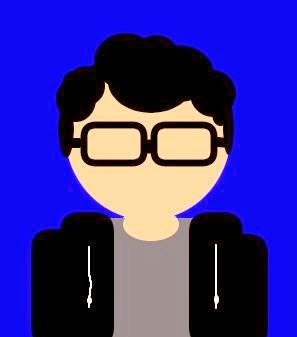 He is currently pursuing a career in games journalism and criticism in Toronto.